Individual cards are marked with the abbreviations for the elements: C, H, O, Cl, N, Br. Each card also shows how many bonds that atom can make. 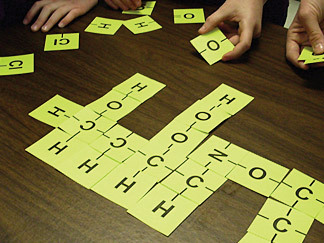 Players lay down their cards, in turn, to form large organic molecules, as they try to get rid of all the cards in their hand. Some games are over quickly, in just 5-10 minutes. But most games last longer, more like 20 minutes. Occasionally a game will go on longer than that. Players should be encouraged to play the game several times, as the outcome of each game (and the molecules formed) can be very different.